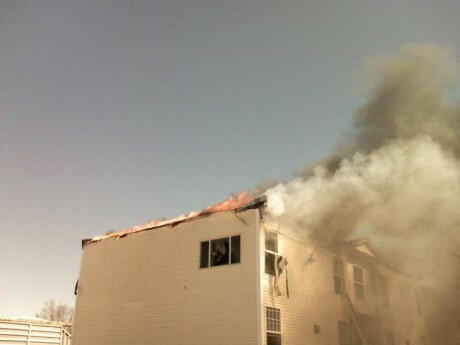 Smoke pours from the roof of one building at Chateau West Apartments, Fulton. 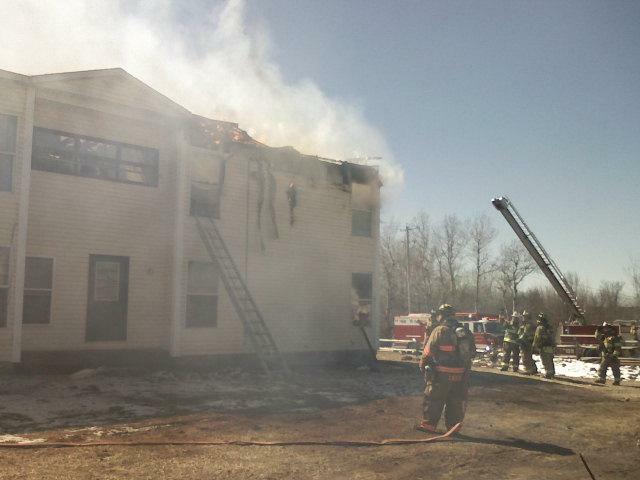 UPDATE, Wednesday, Noon: A Granby Volunteer Fire Department official confirms that there was no firewall in the building. 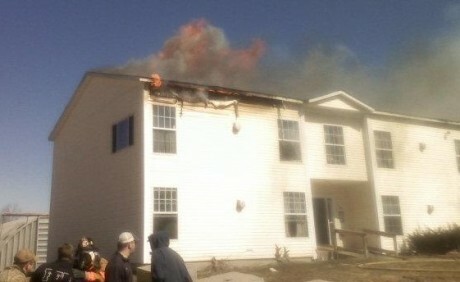 He said it was simply “a damn good job” by the fire crews to contain the damage to the two westernmost apartments. He said the apartments on the east side of the building appeared to suffer some minor water and smoke damage but were likely saved. And the firefighter who received some medical help at the scene was getting help with a cut received elsewhere and was not injured fighting the fire. 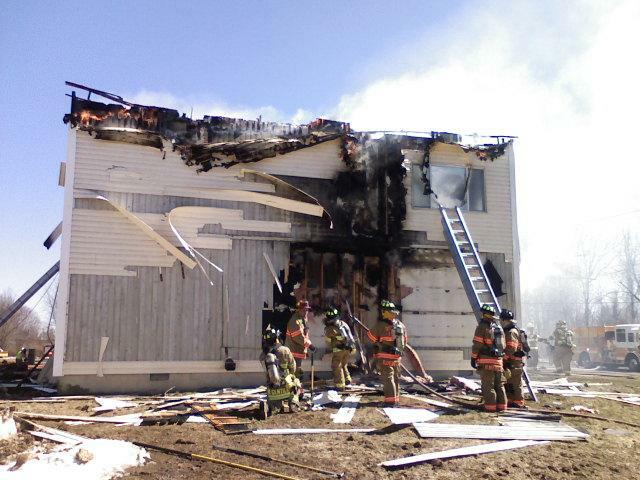 UPDATE, 4:00 p.m.: The Red Cross says 4 families are without homes because of the fire. The 11 people among those four families will receive disaster assistance from the Red Cross, including help with housing, replacement medications, food and clothing. 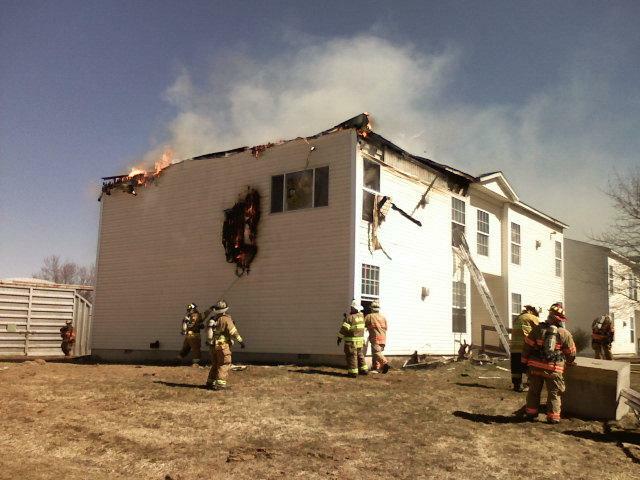 UPDATE, 2:00 p.m.: Grosvent tells us the fire began in a kitchen where french fries were cooking on the stove. Fire broke out around noon in a building of the Chateau West apartments in Fulton. Contributor Rick Grosvent tells us that the fire is in building 12, apartment I. He said it appears the building’s firewall did a good job of containing the fire. No one appeared to have been hurt by the fire, but one firefighter may have suffered a minor injury fighting it. Firefighters from Granby and Fulton responded first, he said, with mutual aid responses from Hannibal, Oswego Town, Cody, Minetto and Phoenix. Smoke envelops a building of Chateau West Apartments. Rick Grosvent photo. 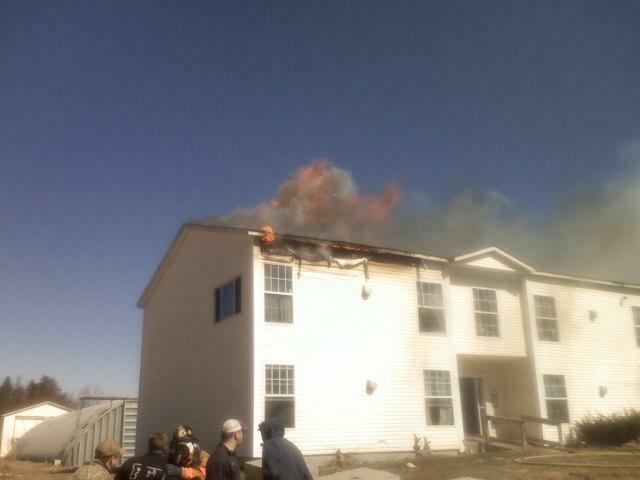 Some flames are visible along the roof line. Rick Grosvent photos. Firefighters tear into the damaged wall at Chateau West Apartments to get at the fire. Rick Grosvent photos. um firewalls dont put out fires and he never said it did. I bet there was a firewall as it did not spread. maybe you should get facts straight before you post on here. and i am shocked that dave alllowed that comment. [Me: I’m not sure I did allow that comment. I don’t remember it and I haven’t been in the system much the last day or so because of a heavy workload. I’m not the only one who checks comments in the system. If I did, my apologies to Rick, who has been a terrific contributor and a friend. I have deleted it as it violates our one rule — no personal attacks. A subsequent comment was not posted because the poster’s “handle” is a vulgarism. His second comment was okay and if he reposts it with a cleaner handle, I’ll let it in. This isn’t Syracuse.com and I’m sorry it got that way for a while here. We’ll check on the firewall issue and fix the story if need be. Bottom line: Anyone can make a mistake. I’ve certainly made them. That’s no reason to attack someone, particularly if you’re going to use a fake name and e-mail address. Just for your information there was no fire wall in this structure as they are very similar to a modular and stacked on top of each other and then a conventional roof put on. The fire was stopped because the men and women that fought this fire knew what they were doing and worked very hard. Great Job By All !!!!! Again no one said anyting bout the our wonderful fire department. What was said was about the firewall slowed it down. I am sure that rick received his info from them. and thanks Dave.. I figured you had not seen it and yes i like to see about the firewall. Thank *you* for letting me know! What i am telling you and I have confirmed this that there is NO firewall in these structures. I believe you. I’m checking and intend to update the story when I confirm it.